With cyber attacks making headlines, you might be well aware of the importance of online security. Staying on top of today’s security needs has become a real challenge. Be it being aware of the growing complexities of your website security infrastructure and the associated budgetary requirements or simply staying up-to-date in such a fast-moving environment, trying to predict what’s coming next seems impossible. Most people tend to forget to add website protection and security when they create their website. You cannot afford to do that in today’s threat landscape. It is critical for you to add protection and security features to your site. Website security is a crucial factor for the success of any web-based business. If security gets compromised, then it will negatively impact the company and sales. If you do not add those features to your website design strategy, a hacker can hack your site and get hold of important digital files and images on your website. You must add website protection and security to your site to prevent cyber attacks and illegal downloading of digital data and images from your website. Make sure to encrypt connections to your website as unencrypted FTP or HTTP connections for your site, or Web server can lead to man-in-the-middle attacks and login password sniffing. You can use encrypted protocols like SSH (Secure Shell) to encrypt connections to your website. If you are not interested in SSH, use TLS (Transport Layer Security) for encryption. Make sure to manage/access your website only from secure networks. Stay away from connecting via an open wireless access point in coffee shops or public Wi-Fi hotspots. It is especially important when you are accessing your website for administrative purposes. If you are in dire need to connect to your website and if there is only an unsecured network available, make sure to use a secure proxy. Make sure to enable HTTPS on your website. It is the best way to encrypt information that you send between a browser and your web server. HTTPS can help protect your site from man-in-the-middle attacks. Furthermore, Google has recently added criteria to its rankings algorithm to better rank websites which have proven to provide the better user experience and security (especially having HTTPS). Make sure to use only secure cookies. A secure cookie (httpOnly cookie) is a type of cookie that only works with HTTP/HTTPS. Failure to use secure cookies on your website would allow a hacker to intercept the cookies sent to the users. Since secure cookies are used only for storing information and hypertext transfer protocol requests, it can prevent exploits such as the Cross-site scripting (XSS). SQL Injections can wreak havoc on your site. In SQL Injection, hackers take control of a web application by injecting malicious SQL codes. SQL Injections can make your website to be flagged as malicious by the major search engines, such as Google. If your site gets flagged as malicious, then your site will appear on the search page with a marked note stating ‘visitors could be at risk,’ if they continue to your website. It could permanently remove all organic web traffic to your site costing you thousands of dollars in lost revenue. You might have spent so much time and money to build your website (and your brand), so you need to be cautious when it comes to website security. 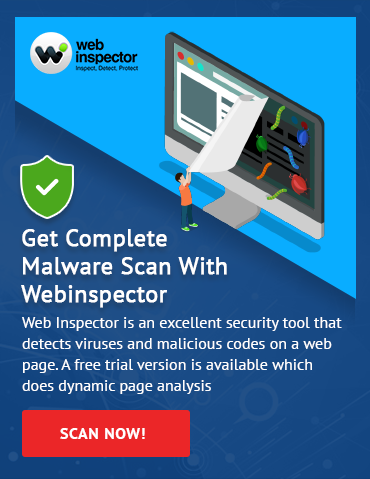 Use Comodo web inspector (a powerful cloud-based malware scanner) to scan your site for vulnerabilities.